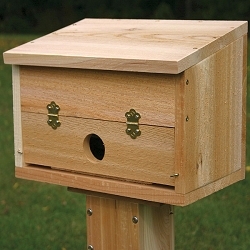 Roosting Pockets for Small Nesting Songbirds! 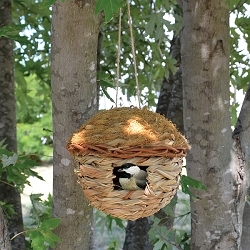 Fill the branches of your backyard trees with these inexpensive, highly functional roosting pockets. 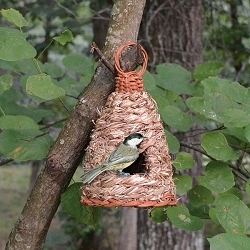 Made from natural grass fibers, it provides a cozy pocket for small nesting birds. 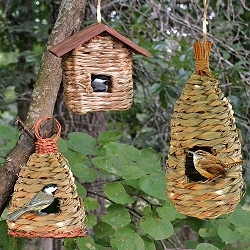 Hang them in multiples and create a whole "community" of feathered neighbors! 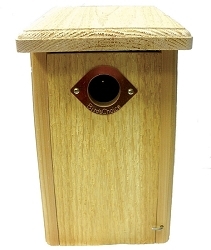 Roosting Pockets are loved by small songbirds year round for nesting and shelter from harsh sun, rain, snow, wind and cold. 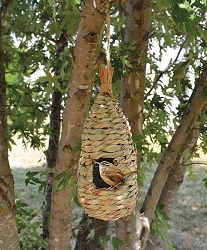 Simply hang your new Roosting Pocket in a tree by looping the twine hanger over a limb. 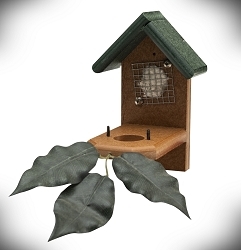 Choose a spot protected by nearby limbs and cover. 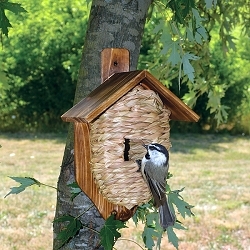 A variety of small songbirds will use this birdhouse including Chickadees, Wrens, and House Finches. Roosting Pockets are especially beneficial to non-migrating songbirds during their winter months. They provide much needed refuge from harsh storms, wind, freezing rain, heavy snow and the bitter cold. Dimensions: 4.3" x 6" x 10.4"